The accuracy and reliability that have made the 1911 an American icon now shine brighter than ever. Features include a crisp trigger, dovetailed front and rear sights, precision-machined slide and frame, and available fine-checkered American walnut grips. 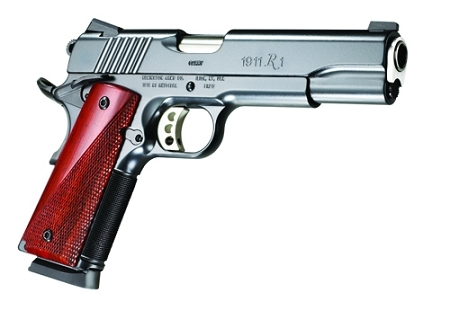 The new Model 1911 R1 is truly the finest blend of exacting craftsmanship and out-of-box performance available today. Every element is produced with ultra-tight tolerances on equipment representing the height of modern technology. The result is a sweet-shooting advancement of a legendary design we’re more than proud to put our name on. The Remington Model 1911 R1 Carry is manufactured with pride and precision, to the exacting standards you’ve come to expect from Remington. Right here in Ilion, New York.